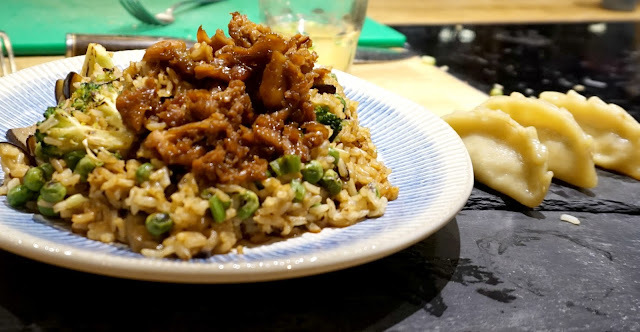 Hopefully you've already caught my posts on my evening at Jamie Oliver's Cookery School and the first of the recipes we cooked - Miso Soup and Pork Gyoza with Gomadare Sauce. My favourite part of everything we made was the teriyaki chicken and stir fry so I wanted to share the recipe with you all. 3. Use immediately or store in a covered jar in the fridge until needed. You should end up with around 400ml. Use half for your chicken teriyaki dish and save the other half for another day. 2. Cut the chicken thighs into 2cm slices, gently flatten them, put into a shallow dish and pour over the teriyaki sauce. Rub the marinate into the chicken to allow it to absorb faster. 4. Preheat your grill to a medium high heat. Place the skewers in a baking tray and cook under the grill for 2 minutes, turn over and baste with a little of the remaining teriyaki sauce. Cook for another 2 minutes then turn over and baste again, continue doing this until the chicken is cooked but also only lightly golden brown. 5. Serve as part of your Japanese feast on top of your green vegetable and brown rice stir fry. Also lovely served with crunchy vegetables or a fresh salad. Let me know if you give this a try at home!